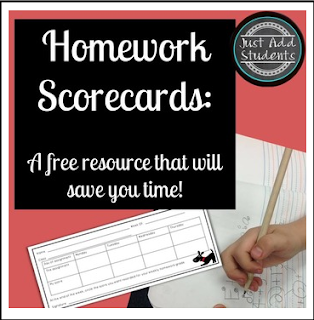 These free homework scorecards make grading easier! Streamline grading by allowing students to grade their "practice" homework, record it on their scorecards, and then choose the score they want you to record in your gradebook at the end of the week. * Two cute scorecards that are ready to be printed and used today...Just Add Students! I hope you enjoy using this product, and that it makes your teaching life easier. If you use and enjoy this product, please leave me feedback. I love it!! Click on the little green star under my store name to follow me. You'll be the first to find out about freebies, sales, and new products!